This entry was written by Sarah Jenkins, posted on 04/23/2015 at 10:05 pm, filed under April 2015 category. Today we ride out of Jerusalem and back down to the Jordan valley. We headed into the Negev, a rocky dessert that is part of southern Israel. There are three stops today – the first is Masada. We can see it from the bus – the desert fortress of Herod the Great! 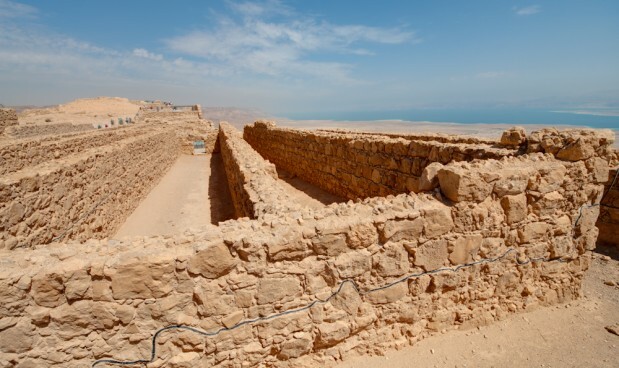 What an impressive fortress built on a plateau nearly 1800 feet above the Dead Sea! Built as a protected palace and garrison for Herod’s troops, Herod died before ever having to use it. The fortress was instead a sanctuary for a band of Jewish zealots who fled the city of Jerusalem. 960 Jews lived here and resolved “never to be servants to the Romans, nor to any other than to God Himself”. The Romans eventually would lay siege to this fortress in an epic confrontation that would end in the death of all but a few of these zealots. Avi led the tour of the plateau while Mark Jenkins led a separate group of the more adventurous members of the group on a side expedition down to the famous Northern Palace of Herod the Great. Seeing the ruins reminded us of how beautiful this place must have been! It’s a hard climb, but absolutely worth it! After leaving Masada, we enjoyed beautiful views of the Dead Sea and Avi, our guide, told us he had a special surprise. We stopped at the Ein Gedi Nature Preserve where we were delighted to see a herd of ibex and several acacia trees. We then walked around and saw David’s Falls, where water from two spring-fed streams flow all year – in the desert! Looking at the formation of rocks and greenery, we could imagine angel wings. Mark Jenkins read one of David’s Psalms where David was seeking refuge in the shadow of His wings (Psalm 57). Back on the bus, we traveled north to the site of the Essene village at the northern end of the Dead Sea, known as Qumran. The ruins here date back to the Herodian era. The Essenes were a group of ultra-religious scribes who formed a commune here. They separated themselves from other religious groups in Jerusalem. Their handiwork was a gift to the ages in what we refer to as the Dead Sea Scrolls. This is a version of the Torah that predates all other known copies of scripture. We explored the ruins of their settlement, and we looked at the caves where these famous scrolls were found in 1947 by a shepherd boy. The Dead Sea is the lowest place on planet earth and is also the saltiest sea on earth. It’s called a sea, but it’s really nothing more than concentrated brine, and not suitable for drinking and definitely not capable of supporting life. We take a few moments for people to fully embrace the Dead Sea experience by getting immersed in the brine – well, as immersed as one can get. Due to the extreme saltiness of the water, one tends to bob along like a cork! The braver members of our group carefully began their descent into the sea, careful not to splash water because the salt in your mouth and eyes will burn. The mud is supposed to be a beauty treatment, so some people piled it on in hopes of emerging with a more youthful appearance. After we get cleaned up from our “swim” in the Dead Sea, we return to our hotel in Jerusalem, tired but excited to see what God has in store for us tomorrow in the Holy City!